See MisterChill's selection of commercial ice makers. At MisterChill, we have an extensive range of commercial ice makers on offer, but we highly recommend Scotsman commercial ice makers. In our experience they are reliable, manufactured to a high quality and available at discount prices. 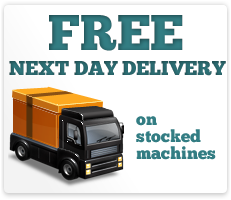 All of the machines we sell are brand new, not refurbished machines or seconds. Each of our commercial ice makers come with their own 24 months parts warranty and we are so confident our products are in top-notch condition, we won't add on unnecessary extras such as extended warranties. It couldn't be easier to order and we make sure we give you the best deal possible. MisterChill delivers direct to your door, normally within 5 working days within mainland UK and we won't charge you for expensive installation, if you're replacing an existing machine your new machine will most probably fit straight in where the old one comes out. If you really do need help installing a machine you most probably already know an engineer who'll do the job for you and full installation instructions are downloadable here from our site.